Determining the right size of intermittent catheter to use can greatly increase the efficiency and comfort of your self-catheterization routine. But how does one choose the correct size to fit their individual needs? Read on to find out more! What Are Catheter French Sizes? All internal catheters, including Foleys and intermittent styles, are sized by a universal gauge system which is referred to as a “French size.” This is based upon the measure of the external diameter of the tube. The way the size is determined is a simple multiplication of 3 (diameters in millimeters multiplied by 3 = the French size). So, if a catheter has a diameter of 4.7 millimeters, the French (Fr) size is 14. 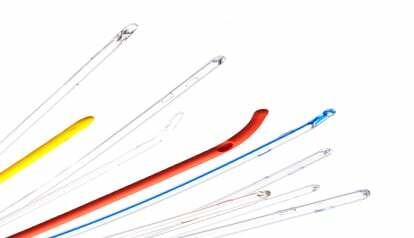 Most vinyl and silicone intermittent catheters with funnels use a universal color-coding system to help you determine what French size a catheter is. See the below chart for the most common French sizes along with their corresponding funnel color codes. 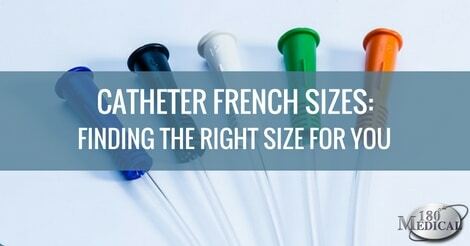 Why is determining the French size such an important part of selecting the right catheter for your needs? Efficiency and comfort are both important elements in the self-catheterization process. If you use a urinary catheter with too large of a diameter for your urethra, cathing can be more difficult and even painful. If it’s far too large, you will not be able to insert it at all. On the other hand, if you use a French size that is too small, you may find that the overall pace of draining your bladder will go much slower. On top of that, if you use a catheter smaller than your urethra, urine released from the bladder will not only escape through the catheter tube but could also go around it, which can get pretty messy, as the flow will be harder to control. Luckily, there is a wide range of sizes all the way from pediatric sizes (for children) to larger French sizes, typically for adults. That way, you and your doctor can select the right size for you! How Do You Find the Catheter That’s Right for You? To determine the right size of the catheter for your individual needs, please be sure to consult with your prescribing healthcare professional, so that you can get a hassle-free experience with your intermittent catheters every time. Contact 180 Medical during our business hours by Live Chat or giving us a call at 1-877-688-2729 to speak to one of our trained, friendly specialists. We are happy to find the right catheter for your needs, and we can also verify your insurance for you to determine your catheter coverage. Curious about what the differences are between the various kinds of catheter materials available today? Learn more about the 3 most common catheter materials here, including red rubber, vinyl, and silicone intermittent catheters. New to using catheters? Learn more about the basics of intermittent catheters – from top to bottom!